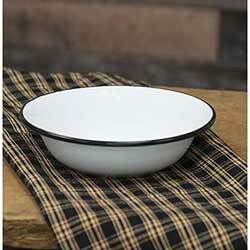 Made from enamel coated steel or aluminum, enamelware is versatile, easy to clean, less fragile than china, and gives a beautiful vintage look to your home! 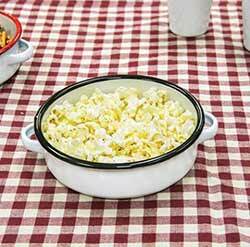 Ditch the plastic, shatterproof enamelware is also great for kids or camping! The classic look is great for any kitchen, and compliments most any decorating style. 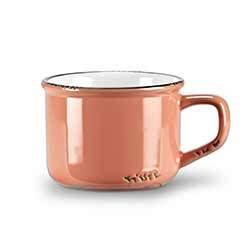 A trendy, coral finish makes this pink/orange enamel cappuccino mug the perfect, versatile piece to add a pop of colour and a vintage flair to any kitchen! Sold as a set of SIX. Enamelware Taper Candle Holder, by CWI. This reproduction candle pan is a lovely vintage accent for your tables and shelves! 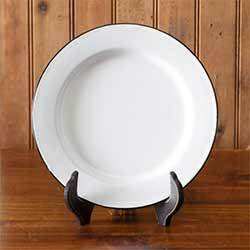 Lightly distressed white enameled metal taper holder with fluted edges and finger loop. Measures 3.5 inches tall and 6 inches wide 98 inches with handle). Holds one standard or LED taper. 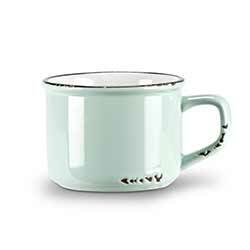 A pastel, mint finish makes this green enamel cappuccino mug the perfect, versatile piece to add a pop of colour and a vintage flair to any kitchen! Sold as a set of SIX. 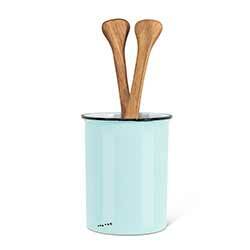 A lovely pastel mint finish makes this green enamel crock the perfect, versatile piece to add a pop of colour and a vintage flair to any kitchen! 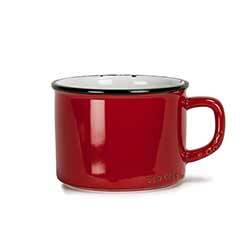 A bold, striking finish makes this red enamel cappuccino mug the perfect, versatile piece to add a pop of colour and a vintage flair to any kitchen! Sold as a set of SIX. A bold, striking finish makes this red enamel crock the perfect, versatile piece to add a pop of colour and a vintage flair to any kitchen! 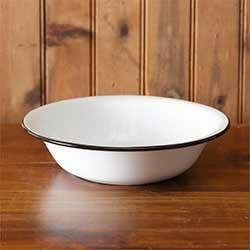 Perfect for the country farmhouse kitchen, this enamelware bowl is crisp white with a black rim. 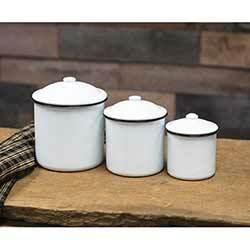 Perfect for the country farmhouse kitchen, this set of three enamelware canisters are crisp white with a black rim. 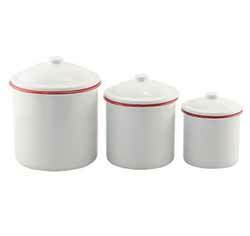 Perfect for the country farmhouse kitchen, this set of three enamelware canisters are crisp white with a cherry red rim. Perfect for storage or organization, such as teas, coffee, or sugar! 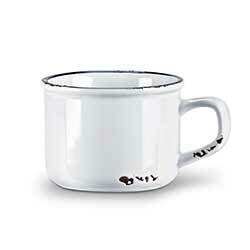 A clean, polished finish makes this white enamel cappuccino mug the perfect, versatile piece to add a pop of colour and a vintage flair to any kitchen! Sold as a set of SIX. 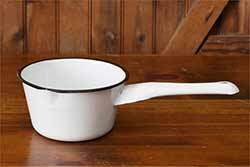 A clean, polished finish makes this white enamel crock the perfect, versatile piece to add a pop of colour and a vintage flair to any kitchen!ur and a vintage flair to any kitchen! Use this dish as a small casserole, serve up snacks, or add a grubby candle and fill with rosehips! 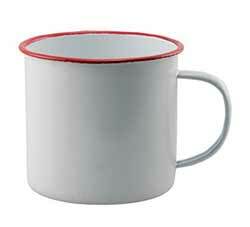 Perfect for the country farmhouse kitchen, this enamelware mug is crisp white with a cherry red rim. Perfect for soups or drinks! 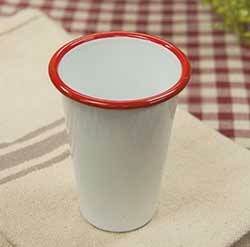 This enameled metal tumber is great for outdoor dining, camping, or picnics! White with black rim. 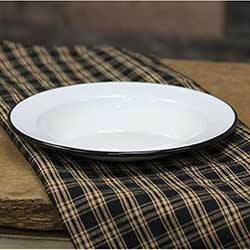 Perfect for the country farmhouse kitchen, this enamelware plate is crisp white with black rim. Perfect for salads, or as a candle plate! 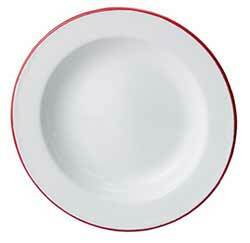 Perfect for the country farmhouse kitchen, this enamelware plate is crisp white with red rim. Perfect for salads, or as a candle plate! 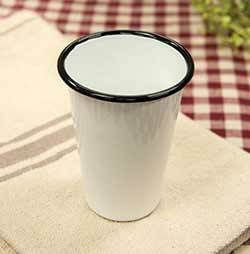 This enameled metal tumbler is great for outdoor dining, camping, or picnics! White with red rim. 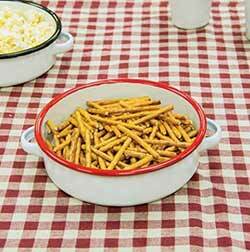 Enamelware is lightweight and shatterproof, great for kids, camping, or everyday use! 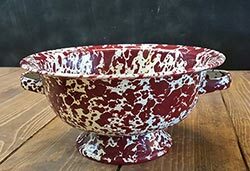 This is for the 1 Quart Bowl, sold in a set of TWO. 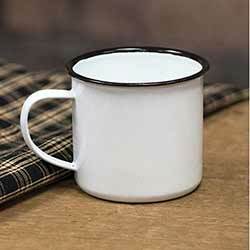 Enamelware is lightweight and shatterproof, great for kids, camping, or everyday use! 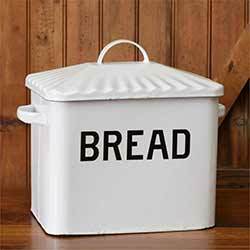 This is for the White Enamelware Bread Box. 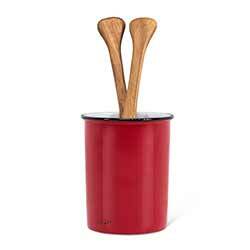 Enamelware is lightweight and shatterproof, great for kids, camping, or everyday use! 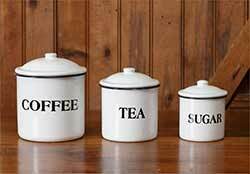 This is for the White Enamelware Canister Set of 3. 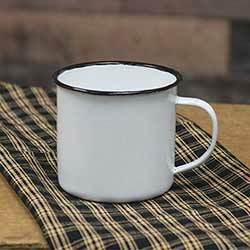 Enamelware is lightweight and shatterproof, great for kids, camping, or everyday use! This is for the 1 Quart Dipper. 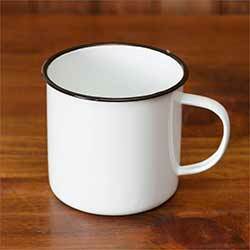 Enamelware is lightweight and shatterproof, great for kids, camping, or everyday use! This is for the 24 ounce Mugs. 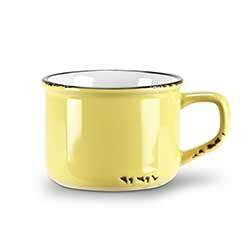 A sunny, vibrant finish makes this yellow enamel cappuccino mug the perfect, versatile piece to add a pop of colour and a vintage flair to any kitchen! Sold as a set of SIX.